Located on the southern edge of Malwa Plateau, the city is located 190 km west of the state capital of Bhopal. With a Census-estimated 2011 population of 1,960,631 distributed over a land area of just (526 km2), Indore is the most densely populated major city in the central province. With more than 13 languages spoken there, Indore is the most linguistically diverse city in central India. The Indore Metropolitan Area's population is the state's largest, with 2.2 million people living there. It is the 14th largest city in India and 147th largest city in the world. 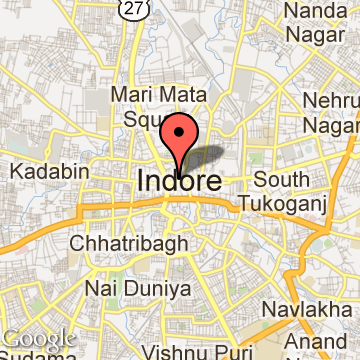 Indore owes its early growth to trade and commerce, which is still a dominant feature of the city. The present city is about 400 year’s old settlement. Till the end of 15th century its original nucleus was a riverside village, which occupied the bank of river Saraswati. This area is now known as Juni Indore. The area of the modern Indore city was a part of the Kampel pargana (administrative unit) during the Mughal Empire. Kampel was administered by the Ujjain sarkar (government) of Malwa Subah (province). The area was controlled by the local zamindars (feudal landlords), who accepted the suzerainty of the Mughal empire. The zamindars received the title of Chaudhari, which established their claim to the land. Indore Tourism - Get all information on Indore tourist places and sightseeing tours. Our website helps you plan your next tour and gives you great ideas on what to do, where to eat, where to stay and when to go there. We give the best information from the web to give you precise, meaningful and useful travel guide for leading places to visit in India and from across the world. Our travel information on INDORE tourist places, tourist attractions, major sightseeing, the best time to visit, the top places to visit in Indore, the must-see things to see and do, maps, restaurants, hotels, nearby tourist destinations, local public information and more. To start with check out information on how to reach Indore.